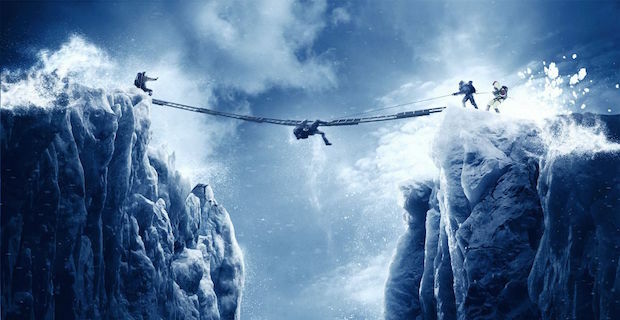 Not since Vertical Limit has a film reached the heights of mountain climbing entertainment achieved by Baltasar Kormákur’s Everest. It’s far from the perfect thriller, but in a time where Hollywood is turning out forgettable films at an incredible rate it’s definitely a title worthy of recommendation. The year is 1996, and for a select group of individuals from across the United States the time has come to push themselves to the absolute limit as they work together to climb the summit of Mount Everest. It’s a journey that will push each of them beyond every limit they believe themselves to have, but not everyone will be up to the challenge. Between the ever-changing landscape, the unpredictable weather, and the often complicated ties that bind us together as human beings, the potential for catastrophe is looming at every turn. When the worst case scenario arrives, we the audience have a front row seat to one of the best demonstrations of the human spirit and its ability to fight for survival in recent memory. Leading the adventurers is Jason Clarke as Rob Hall, an expert hired to guide everyone on their ascent. He’s a soon-to-be father with years of climbing experience, and though he has no reason to return he cannot help feeling as if the mountain calls to him. The same inability to ignore the idea that one might be able to accomplish the impossible resonates in everyone on the journey, from the Texas native stuck in a difficult marriage (Josh Brolin), to the mailman who spent everything he had to try tackling Everest’s highest peak (John Hawkes). They all have their own reasons for accepting the call of the mountain, but in order for anyone to make it back alive they must learn to live and work together. The first hour of Everest is dedicated to acclimation, both for our characters and the audience. We learn of everyone’s personal journey, including the things they seem to be running away from in undertaking the ascent, and they in turn learn to live with one another. This time also serves as our initial introduction to the mountain, which is captured beautifully with stunning images that never cease to send shivers down your spine. You believe everyone in the film to be at least a little crazy for challenging themselves to such a ridiculous task, but part of you cannot help respecting them at the same time. Things move smoothly through the majority of the first two acts, but there is almost a complete lack of thrills and suspense until the ascent for the summit finally begins. That is when the team faces their biggest challenges as climbers, and when they encounter a giant storm cell that threatens to pummel them for an untold amount of time. They understand the danger, but continue to chase after the summit, and honestly it’s hard to argue with their decision. Even knowing what lies ahead for them, it’s hard to believe anyone could simply walk away from the summit of Everest after weeks of tiring work when it was mere hours away from your grasp. The human spirit exists to fight such cowardice, and more often than not that is for the best. On this occasion, however, it proves to be the source of everyone’s undoing. When a storm eventually arrives no one is prepared for the hell it will unleash. Every single character on the mountain must fight for their lives against forces no humans should be forced to endure, and as you can imagine not everyone is ready for that fight. The best anyone can do, including those with years of experience, is to work with their fellow climbers in an incredibly futile attempt at seeking shelter. The truth is that no true shelter exists at the top of Everest. There is only cold, and more cold. Everest captures the desperation of those trapped, as well as those waiting for them to return, and thanks to a combination of strong performances with great direction every emotional cue hits hard. All this said, there is something missing at the heart of Everest. Though everyone performs admirably and the digitally rendered visuals never cease to be jaw-dropping, the film takes far too long to pull you into the journey at hand. By the time our leads begin the true ascent towards the summit there is less than an hour of runtime left. The strong performances give weight to what would otherwise be a rushed third act, but you’re still left feeling as if the entire affair was oddly unbalanced. For as long as the film takes to introduce everyone and make us genuinely care about their lives, it essentially rushes through the most harrowing–and arguably most entertaining–parts of their story. It’s frustrating, but not enough to make you write off the film as a whole. If the goal of Everest is to remind everyone that trying to reach the highest point on Earth is something only the bravest of souls should attempt then by all means it is a success. There is bravery on display throughout the film that made me feel far like more of a scaredy-cat than I think anyone would care to admit. That said, the film takes far too long to find a pulse. The cast does a fine job of bringing everyone and everything to life, but once you’re fully ingrained in the narrative it picks up speed to a break-neck pace that’s entirely unnecessary. With an extra twenty minutes Everest could have risen to heights that films of this nature rarely even grasp at, but instead it’s just another ‘good enough’ thriller that packs a surprising amount of heart.